But it's true; 1. I hate nuts in my bread (i love nuts, just not in my bread, ya know?). 2. I don't always like taste of bananas not it's natural form or blended into a smoothie. In a large bowl mix mashed banana, eggs, oil, honey, sugar, vanilla, and applesauce. Mix well. If you like your banana bread to have chunks of banana, don't mash as much, but if you want a thin consistency of your batter, you can use a blender or hand mixer. In a small bowl mix your flour, salt, and baking soda. Add your dry ingredients to your wet ingredients and mix well. In a bread pan drizzle a little vegetable oil on the surface prevent from sticking. Bake bread in oven for 45-50 minutes, checking after the first 30 minutes and then every 10 minutes after that until a sharp knife or tooth pick comes out of the bread without any wet mixture on it. When bread is done, take out and cool. Slice and eat alone or add pumpkin butter, regular butter, or even cream cheese (vegan of course). I brought this bread to my office and it was a hit among most people. One of my coworkers couldn't stop eating it while some really didn't believe me when I said they're healthy. In any case, this is a great way to use up your bananas that you have sitting on your counter! Especially if you have an urge to bake at 11pm. One of my faves! Yum! Well, when I saw "dairy free" and "vegan", I thought Great. But alas, it has eggs, so it's not vegan, and I consider eggs as a dairy item, personally. I will try it with egg replacement. Can I leave out the coconut sugar, cause I don't have any, and there is honey as a sweetener? Hi B Bop. So sorry for not replying. You can use applesauce, mashed banana, or peanut butter to replace the egg. What type of all purpose flour did you use? I have a tree nut allergy could you substitute regular sugar for the coconut sugar ? Can you use coconut oil in place of the vegetable oil? I tried this today but it didn't rise in the oven :/ Tastes amazing, but I cooked it for double the amount of time and was still doughy in the middle. Any ideas on why it didn't rise? 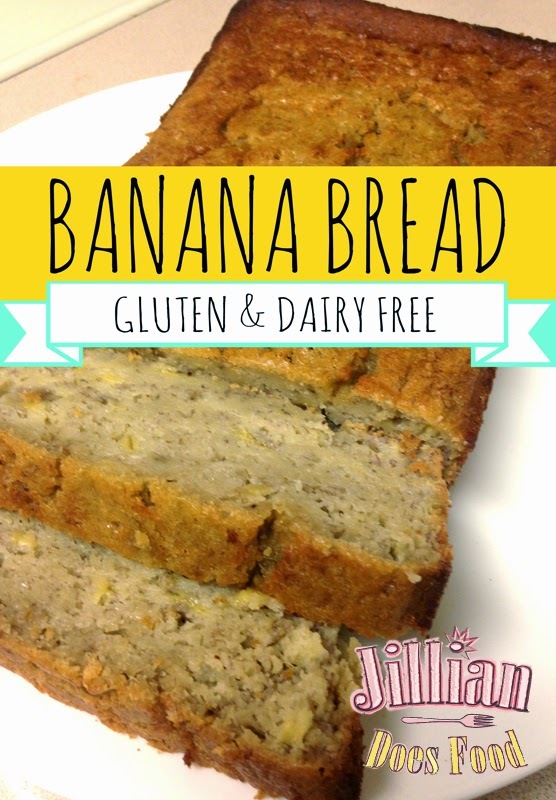 Just made this and it is so good Had really ripe bananas this was quick, tasty, and so good right out of the oven! My question is should it be in the fridge? Or can it be on the counter in a container? Hello. Second time making this Banana Bread today. Thank you for the recipe. I enjoy the simple ingredients and that is is dairy free. My son has a dairy allergy. It's very good :) Takes a mere 10 minutes to whip everything together, but took me about an hour 10 min to bake. I don't mind though. Welcome to my health blog, where I am testing all kinds of gluten free, dairy free, vegan, vegetarian, and clean eating recipes!